Bisma Eight is a boutique hotel located very close (walkable) to the center of Ubud, the Zen capital of Bali. Despite its proximity to the hustle and bustle of tourists wandering around the center, the sounds of animals and the verdant landscape around the property will give you a sense of momentary isolation, even though you are in one of Indonesia's top tourist destinations. The Bisma Eight is located within 15 minutes walking from the center of Ubud, allowing you to explore many attractions the city offers on foot, among them the Ubud Market, the Sarawasti Temple; as well as have access to the many vegetarian and vegan restaurants and cafes around there. If you do not want to walk, you can take the shuttle that departs from the hotel every hour (from 9 am to 5 pm) to the Puri Lukisan Museum and from there continue walking around Ubud. One of the main highlights of this boutique hotel is the infinity pool overlooking the Ubud forest. 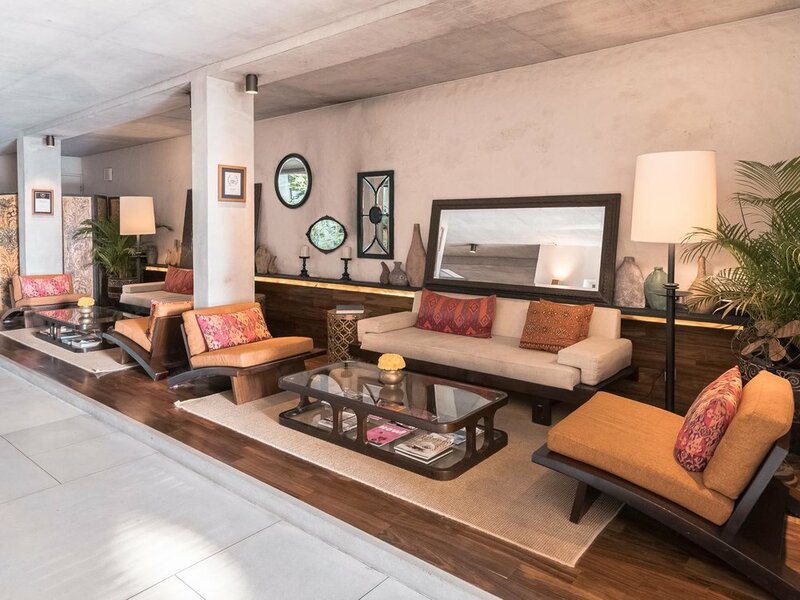 Here you will have access to sun loungers and beds to relax and enjoy the day, as well as order food and drinks at the pool bar. If you want to stay in it until the night comes, do not worry, the pool’s water is heated. 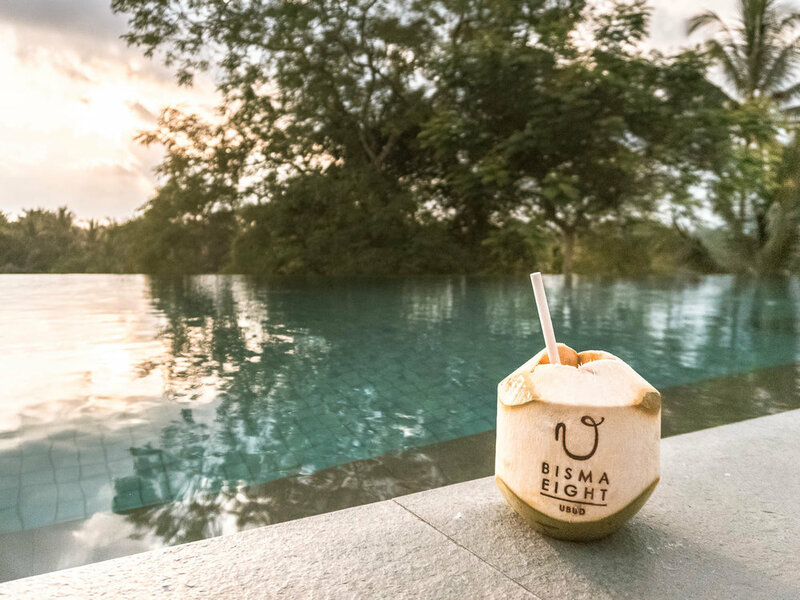 Bisma also offers guests free yoga classes every morning at 8 am, and other free activities that vary throughout the week, such as cooking classes, Balinese offerings workshop, Balinese dance classes, etc. Be sure to register for these activities in advance. Keeping the main characteristic of all boutique hotels, Bisma Eight has only 38 suites, which are divided into 3 categories: Garden Suites (overlooking the patio with bamboo walls and outdoor seating and relaxing area); Canopy Suites (which are located on the second floor, above the Garden Suites); and Forest Suites (these are the suites closest to the pool, overlooking the Ubud forest and which have a balcony with table and chair to enjoy the energy of the place). We stayed in the Garden Suite, with its spacious 54 m2, including a small living room with TV and sofa separated from the bedroom, and bathroom with Japanese style tub. 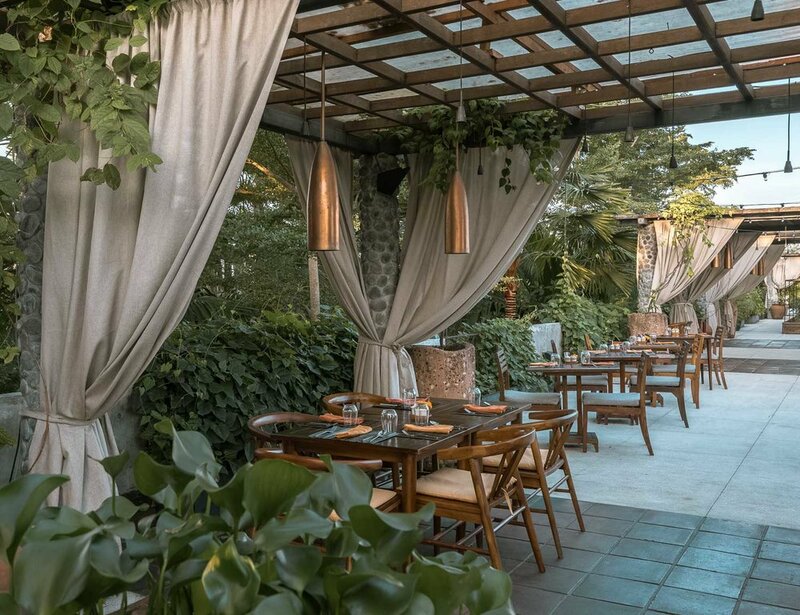 Also on the property, you will find a restaurant called Copper, a rooftop restaurant where breakfast is also served, a coffee shop and the pool bar. In addition, guests of the Bisma Eight have discounts at the Folk Bar (a bar with a pool, and good to get away from the many tours you will do every day in Ubud) and two other establishments that are also part of the group - No Más and Liap Liap. Upon arrival at the Bisma Eight, we were greeted by the staff with a welcome drink and each given a Balinese offering to be placed, along with making a wish, by the statue of Ganesha (which is in a small grotto at the hotel entrance). Unfortunately, the hotel does not have a dreamy spa, but it is possible to schedule in-room massages. On the other hand, breakfast can be ordered in the room with no additional cost.